Space Art is a genre of science fiction and fantasy-based artwork focusing on outer space: the stars and galaxies, alien landscapes, futuristic vessels exploring the far reaches of the galaxy, and specific astronomical events such as black holes, supernovas, and neutron stars. Many wonderful examples of space art can be found illustrating the covers of classic science fiction novels or scifi magazines such as The Magazine of Fantasy and Science Fiction, Analog and Starlog. I became interested in space art when I began attending science fiction conventions and saw many captivating examples of the genre in convention art shows and print shops. The artist who most intrigued me with his work was Richard M. Powers, whose work was more surrealist in style than strictly astronomical. His paintings seemed inspired by some of the great surrealist artists whom I already greatly admired, particularly Yves Tanguy. I, in turn, looked to both of these artists for inspiration and ideas in my own attempts at combining science fiction and surrealist themes. Here you will see a selection of some of my "space art" paintings, primarily completed in watercolor and gouache, sometimes with mixed media accents. I know the title of this painting is a little odd for a work of astronomical art, yet I felt it was somehow quite appropriate. There's a static peace and tranquility to this image that I like. I never can predict exactly how one of these paintings will come out when I begin them as the process is so organic and unplanned, and sometimes they work and sometimes they don't. This was one of those times it worked really well, I thought. I've heard this piece described as "jellyfish in space", which is somewhat appropriate. Like many of my astronomical pieces, I did not begin it with a specific idea in mind, merely laying down some dark color washes, adding a little gouache white and grey, and then seeing what evolved. This piece was definitely inspired by Tanguy and Powers' work, both of whom I'd been immersing myself in for a few weeks before beginning the painting. I seriously adore much of the classic scifi art found on the pulp paperbacks of the 50s through the early 70s, which I think you'll get a sense of as you browse the other paintings in this gallery. This image is a more "traditional" piece of space art although it still began as an abstract color wash of reds, yellows and blues. I built up several layers of washes before starting to see an interesting effect emerge, and then I added the rugged landscape, stars and planets to complete the painting. This is another piece greatly inspired by Yves Tanguy and his fantastical, surreal landscapes. There's also perhaps a touch of abstract expressionism in this one, the thin lines of paint applied in a fast manner similar to Jackson Pollock. This is one of my personal favorite pieces of surreal/space art that I've completed to date. Many of my astronomical watercolors take many days or weeks to complete. This piece was an exception to that general rule. The landscape of rough terrain and fiery skies began to reveal itself quickly as I laid down my very first color washes, so I attempted to complete this piece in just one session before the watercolor had dried and become unworkable. I only returned to it once to define some of the mountain peaks and add a touch of opaque color in the foreground. Remember, you can find cool merchandise with my space art designs in my CafePress Space Art Store! Many images not shown here are available on jewelry items, mugs, notebooks, smart phone cases, totes bags, and other useful items! These are great gifts for anyone interested in science fiction and astronomical artwork. Dark, toxic smoke rises from a bleak landscape as alien craft set out for safety. This painting evolved over many sessions, a story beginning to take place as I experimented with paint drips, washes and different shapes. This is one of my very "retro" pieces, inspired heavily by the wonderful science fiction art of the science fiction pulp paperbacks of the past. I grew up reading those books and always was drawn to the ones with the most intriguing cover art first. The last piece I'm including here is a real winner - truly! It won the 2006 Dragon*Con Attendee award for "Best Spaceship or Space Scene". Given how large Dragon*Con is and how many artists exhibit there, this was indeed a tremendous honor to me. A collection of great artists links and groups dedicated to science fiction artwork. A blog devoted to space art and space artists. ASFA is the Association of Science Fiction and Fantasy Artists. Join to connect with other artists worldwide and get the latest information on upcoming conventions and art shows, awards and ways to promote your artwork. Spray paint space art is hot! Check out this great site devoted to this developing genre of space art. Collection of works by gifted spray paint space artists. A collection of free astronomical art, prints, and illustrations. The first thing that crossed my mind with your Jellyfish in Space is dark matter, which is believed to surround many galaxies, and even may connect like a web from one galaxy to another. Stunning! These artists are certainly talented. These are amazing! 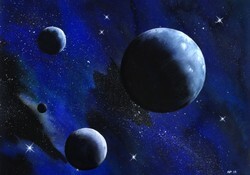 I love "out of this world" cosmic art - my husband is also an artist who has produced some work along these lines. Yves Tanguy was an important artist of the surrealist movement. Learn more about his background, his work, and his legacy.